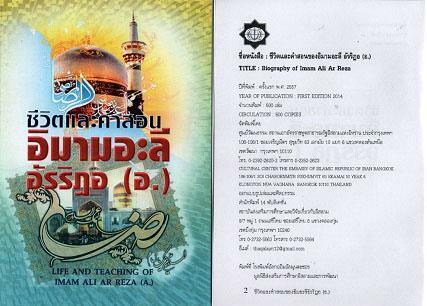 JNN 27 Feb 2014 Bangkok : A book titled “Seerah and Teachings of Imam Reza (AS)” has been published by Iranian Cultural Center in Thailand. According to IQNA’s branch in East Asia, the book which is written in Thai language, includes a biography of the eighth infallible Imam (AS) and a summary of papers and speeches presented at the scientific forum of “Imam Reza (AS); Heritage of Ahl-ul-Bayt’s (AS) Teachings” in Thailand. The 60-page book also covers some 50 sayings and Hadiths of Imam Reza (AS). The Iranian center plans to present it at the international book fair to be held from March 28 to April 7 in Bangkok. This entry was posted in Asia Pacific and tagged Bangkok, Imam Ali Raza a.s, imam reza, Irani Cultural Centers, Iranian Cultural Center, Islamic Propogation, Teachings, Thai Language, Thailand. Bookmark the permalink.